The World VMax (Mod. 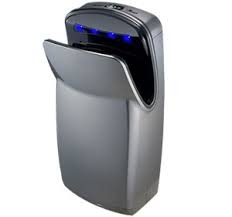 V-629A) is a vertical “hands in” hand dryer. This surface-mounted unit is high-speed, low-noise, and energy-efficient. With a 25% larger hand opening than the competition, using the VMax truly is a touchless operation. Although the VMax is a touch-free, anti-microbial additives are integrated into the external surface, making it ultra-hygienic. As the user places his hands into the unit (without ever touching any surface), the infra-red sensors detect the hands. Once the user’s hands are removed, the dryer automatically turns off. Rather than blowing air over hands & blowing water into the floor & wall, the VMax has a drain incorporated into its hand drying cavity. The droplets of water blown off a user's hands are captured in a hygienic drainage tray, leaving the dryer, the wall, & the floor free of moisture and water marks. Hands are fully dry in approx. 12 seconds, but the actual length of the run cycle is determined by the user. The energy-efficient motor can produce an air velocity of 29,480 LFM or 335 mph and an air volume of 85 cubic feet per minute, while producing low sound levels. The faster dry time means less electricity is used. And since no heating element is required, the World VMax consumes considerably less energy than warm air hand dryers that work on the concept of evaporation. The powerful universal brush type motor spins at the rate of 35,000 times a minute while only requiring 1200 watts to do so. The VMax motor is powerful enough to draw all of its air through a dense, replaceable HEPA filter (with an odor neutralizing tablet) prior to ever touching the user’s hands. The air this unit returns to the washroom is actually cleaner than the air it draws in. The VMax features an intelligent maintenance system; the attractive LED display indicates when to empty the water tray and change the HEPA filter. The silver-gray, high-impact Polycarbonate ABS cover is both durable and vandal resistant. Similar to the color molded bumpers found on today's automobiles, the durable, scratch-resistant plastic bounces back to its original form (even after a significant impact) free of damage. 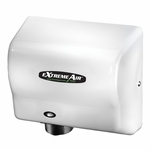 Unique among all vertical hands-in, surface-mounted hand dryers, the VMax comes prewired with a polarized wall plug, eliminating the need to hard wire. Simple utilize the included mounting bracket to adhere the unit to the wall surface and plug the preinstalled flexible power cord into a nearby standard 120VAC wall socket. When properly installed, this dryer complies with the highest Americans with Disabilities Act (ADA) accessibility standards. Mounting instructions and warranty information are included.